Support for third-party candidates among young voters tough for Clinton. 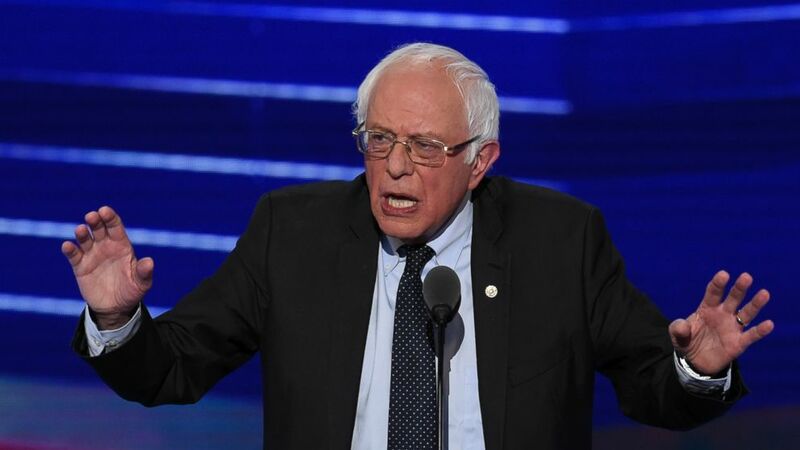 camera (Saul Loeb/AFP/Getty Images) Sen. Bernie Sanders speaks during Day 1 of the Democratic National Convention in Philadelphia, July 25, 2016. With Bernie Sanders out of the presidential race, Hillary Clinton has moved to consolidate her support in his broad base of young voters. But much of that backing is grudging, with turnout an open question and support for third-party candidates posing a potential risk to Clinton. She easily leads Donald Trump among 18- to 29-year-old registered voters in the latest ABC News-Washington Post poll, 57-31 percent, making them her single best age group. That 26-point margin doesn’t match Barack Obama’s record-setting support from young voters in 2008 (66-32 percent), but it beats the gap in his 2012 result (60-37 percent). See PDF with data tables here. Still, that doesn’t mean young voters are happy about it. Just 22 percent say they’re satisfied with a choice of Clinton and Trump, with a majority “very” dissatisfied. Twice as many of those 30 and older are satisfied, 43 percent. That dissatisfaction could influence turnout, often a concern with young adults. They account for 21 percent of all adults but just 14 percent of likely voters in the survey, produced for ABC News by Langer Research Associates. It also encourages a look elsewhere. When Libertarian Gary Johnson and Jill Stein of the Green Party are included, Clinton leads Trump by 19 points among under-30s, 43-24 percent, with 16 percent supporting Johnson and 10 percent supporting Stein – their best among any age group. These margins have changed little from before the conventions, suggesting that their unifying influence among partisans was somewhat lost on more independent young voters. Indeed, in combined data since June, 24 percent of Clinton’s young supporters in a two-way matchup move to a third-party or independent candidate in the four-way trial heat. Such results reflect ambivalence toward Clinton among young Sanders supporters. Given a four-way race, only 53 percent of Sanders supporters age 18-29 pick Clinton (again in combined June, July and August polling), compared with 72 percent of Sanders’ supporters age 30-plus. On the Republican side, where Trump has less support from under-30s in the first place, losing about one in seven young Trump supporters to third-party choices in a four-way contest, compared with the one in four Clinton loses. Among older Trump supporters, just one in 10 leaves him in the four-way matchup. Notable, too, is that Clinton loses some young voters both to Johnson and Stein; Trump, to Johnson only. Summertime flings don’t always endure. In ABC News-Washington Post polling in early August 1996, 20 percent of 18-29s favored Ross Perot over Bill Clinton and Bob Dole, compared with 12 percent of those 30 and older. But young voters’ support for Perot dwindled to 10 percent by Election Day, similar to other age groups. Further, in 2000, Ralph Nader and Pat Buchanan both peaked among young voters (and among likely voters overall) in late July. Where the under-30s land this year – and how many of them turn out – could be critical to the election outcome.